I was going to mince the lamb once I boned it but that got a little too hard i.e. I was getting hungry…so Mod 1 was to dice the lamb and brown it with the ingredients for the koftas above; Mod 2 substituted two teaspoons of crushed (store bought) coriander.Mod 3 did away with the pinch of granulated sugar because I forgot. Once the lamb was browned, it was added to the sauce mix . At the same time, I tossed a cup of rice into the rice cooker (after, of source, rinsing the rice three times to remove any dust or residues). 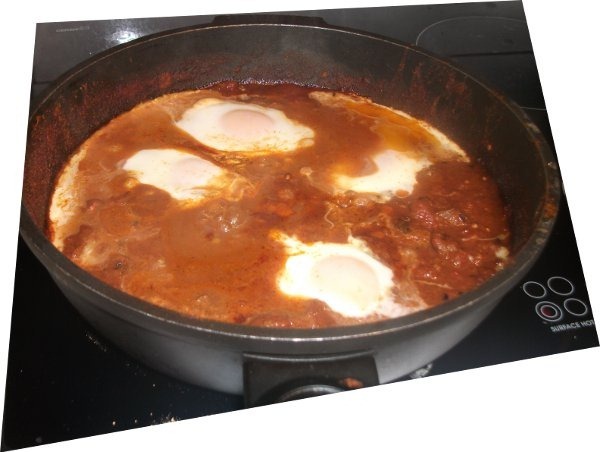 The interesting thing about this recipe is that the eggs are cooked sitting on top of the mix. I left this a little late and was still waiting when the ‘ready’ button popped on the rice cooker. 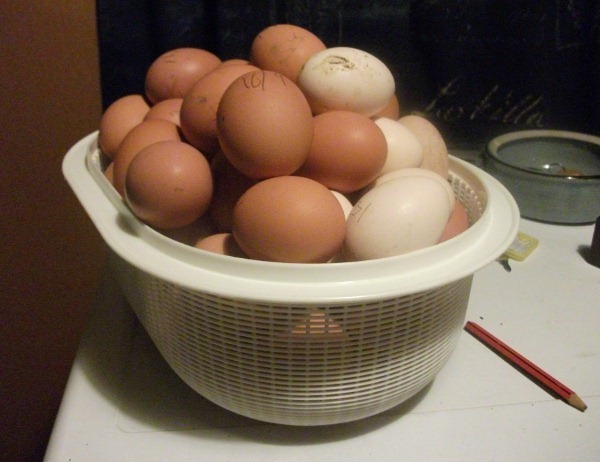 I probably should have dropped the eggs in about ten minutes earlier so that everything all came together at the same time. 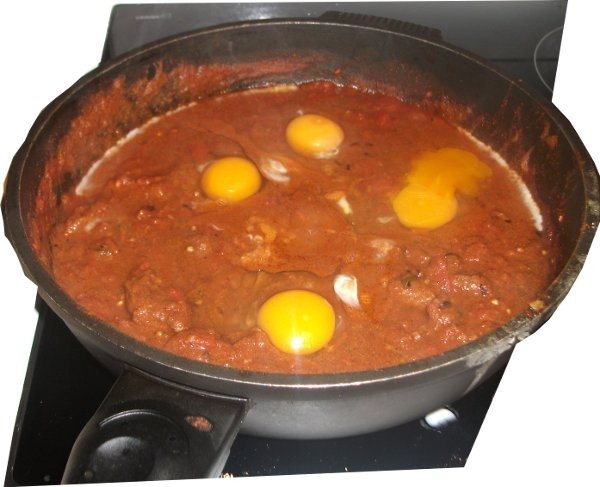 As the original recipe was for a mince dish, serving would have been a doddle: because I diced the lamb instead of mincing it, I had not factored in the extra difficulty in scooping out the eggs amidst the chunks of lamb without causing the eggs to break apart. A lesson for next time although, in all truthfulness, cooking the eggs in the kofta mix is a bit of a novelty but could be just as easily cooked separately and laid on top of the kofta mix and rice. 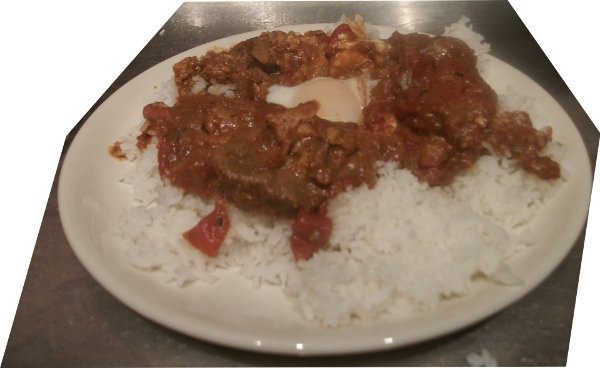 This would let the eggs retain a flavour distinct from the spices of the kofta mix – as it is the eggs only really provide a textural contrast to the rice and kofta. The ultimate test is of course the taste test. Despite the quantity of spices in the kofta and sauce, the taste was nice but nothing special although I did overcook aka burn the onion and spices as I got distracted in the laundry at a critical moment + we have been wondering if we need to turn over our spices more often to keep them fresh and active. I think that this is more down to me than the original recipe so I will report back after I have another crack at this, next time using minced meat..and paying more attention to the heat for the spices….